A hearing test at TOLBECS is a basic screening hearing test which compares your hearing to normal levels. 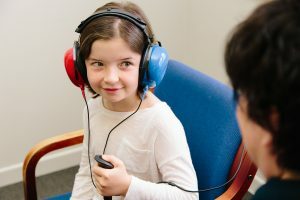 At TOLBECS, we test hearing using an audiometer. 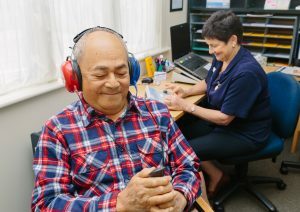 This is a screening hearing test – the same hearing test that is conducted in schools, workplaces and clinics throughout NZ. Our hearing test involves placing tight-fitting ear muffs over your ears to block out most of the surrounding noise. We will then administer a number of beeping noises and ask you to press a button every time you hear a beep. Each ear is tested separately. The results are plotted on a graph which is called an audiogram. The test takes about 10 minutes. You can compare your hearing to normal levels. Our Ear Nurse Therapists explain fully what your results mean, and recommend any further action if required. Similar to an eye test where if you pass that means your eye sight is good and if you fail you are advised to see an optician, after a hearing test if your hearing is not as expected, we may recommend that you consult with an Audiologist for further testing and investigation. Who may want a hearing test? Book an appointment or phone (07) 856 0002.